A fun-fact segment about Call of Duty: Black Ops has revealed new information about its multiplayer editor, probably. I know that every Call of Duty fan probably knows everything about the game already, but I'm actually not one of those, so a recent post on the PlayStation Blog by Treyarch community manager Josh Olin might be informative to the rest of us. He calls the post "little-known facts" about Call of Duty: Black Ops, and it details a bunch of features you may not know about. For example, did you know Black Ops will have a very customizable multiplayer game editor? Using it, players will apparently be able to create all sorts of different game types with more freedom than ever before. Olin says the custom games editor will allow you to edit simple variables such as time limit or score limit, but also deeper aspects of a game including the weapons, perks, and gear available. He reveals that if you want a "pistols only" match, you can go ahead and make one. Custom games apparently no longer rely on the "honor system." It sounds a lot like the multiplayer editor in GoldenEye 007 to me. 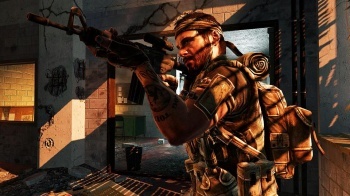 He also talks about how online split-screen multiplayer is being brought back in Black Ops. Did it ever leave? I have no clue. Anyway, players can add a friend through a guest account that can join up in split-screen multiplayer. The guest will be able to earn ranks and unlocks, but all guest progress will disappear when the guest leaves. I've always been surprised that split-screen was abandoned in many modern first-person console shooters, but at least it seems to be a priority again. Olin went on to describe the addition of an in-game friends list, regional matchmaking, and multiplayer game privacy that can lock out people you don't want in. In addition, something called "emblems" will not be reset when you "prestige." Everything else will reset, but emblems will not. Is that a big deal? I'm relying on you here. Well, did I get through that without embarrassing myself? Call of Duty: Black Ops will be available on November 9.